Faith must have adequate evidence, else it is mere superstition. Unfortunately, most people prefer to believe that their 'spiritual experiences' validate the religion, or spiritual path, they are connected with. YOU ARE HERE Part 3: Faith and The Bible. Christianity is perhaps the only religion that does not demand 'blind faith' from its followers. Many faiths today ask seekers to discover the truth of their religion or belief by experiencing it, rather than by theory... the try-it-you'll-like-it approach. However, what most people do not seem to realize is that Christianity is perhaps the only religion that does not demand 'blind faith' from its followers. Whether you are aware of it or not, faith plays a huge part in many, if not most religions of the world. However, faith can mean two different things. It can mean reasonable trust based on evidence. On the other hand, faith can also mean trust or belief without evidence, or contrary to evidence. Anyone can claim to be divine, or divinely inspired. What we need to do is stop checking our brains in at the door and ask the million dollar question, i.e. what evidence supports the many claims made by various religions, whether it comes from the founder of the religion, their holy book, or one of the leaders/teachers of that religion? So what's different about Christianity? It is also often thought that the entire Christian faith is nothing more than 'religious wishful thinking' but, much to the contrary, the Christian faith is a commitment based on evidence. So what's so different about Christianity? It is also often thought that the entire Christian faith is nothing more than 'religious wishful thinking'. Much to the contrary, the Christian faith is a commitment based on evidence. It is actually quite remarkable as to how many times, God, Jesus, and the prophets of both the Old and New Testaments, appealed to facts to support what they said and taught. Many faiths today ask seekers to discover the truth of their religion or belief by experiencing it, rather than by theory... the try-it-you'll-like-it approach. And people do so.. in droves. While there is little doubt that, particularly when it comes to Eastern faiths, a vast number of people feel that something has changed within them as a direct result of their spiritual practices. Many, apparently, experience a sense of peace, and physical and emotional well being, which often affects how they relate to the world around them. These internal experiences, are often referred to as "enlightenment", or a "spiritual awakening". However, thousands of others, taking it many steps further, ascribe these changes to the 'awakening to the divine within you', or 'becoming one with Deity'. It is but common sense to apply logical and objective reasoning to your spiritual life, which it seems most people are not inclined to do... preferring to believe that their 'spiritual experiences' actually validate the religion, or spiritual path, they are connected with. However, what most people do not seem to realize is that Christianity is perhaps the only religion that does not demand 'blind faith' from its followers. Which boils down to ... try it and see if it works. However, none of the above means that faith is nonexistent in the Buddhist world. As blogger Kathy Kiefer rightly points out (Emphasis added). One has to have faith that there is no god but Allah and Muhammad was his Messenger. But one has to ask what this faith is to be based on? "The mystery of life and beyond life, of Siva, is really better understood through faith than through intellectual reasoning", since "The intellect in its capacity to contain truth is a very limited tool". faith is not a static state; rather, it is constantly deepening through personal experience and growth. The spiritual truths of Sanatana Dharma, initially accepted without proof, are ultimately proved through personal experience. Swami Chinmayananda, founder of Chinmaya Mission, succinctly conveyed this concept: "Faith is to believe what you do not see. The reward of faith is to see what you believed." Faith in its initial stage is simple belief without the support of either knowledge or experience. In the third stage of faith, personal experience transforms informed conviction into certainty. The problem being that the explanations for these supernatural experiences given by these yogis, rishis and sadhus over the centuries is generally accepted as being true. However, we quite simply have to have blind faith that they, as mere men, were right in what they said and taught and that we can trust them. Bahá’u’lláh claimed to be nothing less than a new and independent Messenger from God. His life, work, and influence parallel that of Abraham, Krishna, Moses, Zoroaster, Buddha, Christ, and Muhammad. Bahá’ís view Bahá’u’lláh as the most recent in this succession of divine Messengers. Sikhism is said to be the fifth largest religion in the world with over 30 million adherents worldwide. It is a monotheistic religion... the basic Sikh belief represented by the phrase Ik Onkar (One God). Guru Nanak was born into a deeply divided, and highly discriminative and prejudicial society. Hindus and Muslims were in constant conflict, women were treated as inferior beings, and the caste system ensured that the common man was brutally oppressed by the ruling classes. Zarathusthra (Zoroaster), religious reformer and founder of Zoroastrianism is said to have received a vision from Ahura Mazda (the Wise Lord), who appointed him to preach the truth. He is believed to have composed the Gathas, 17 hymns which are the most sacred texts of the Zoroastrian faith. Anyone, can claim to be divine, or divinely inspired. However, should the claimant have a charismatic, powerful personality, spout profound sounding statements, and proclaim an enigmatic or feel good message, their assertions suddenly becomes 'truth' to millions of people. Sometimes, it seems to me, that the more convoluted the language, the more people will firmly latch on to the coat tails of the speaker. What we need to do is stop checking our brains in at the door and ask the million dollar question... what evidence supports the many claims made by various religions, whether it comes from the founder of the religion, their holy book, or one of the leaders/teachers of that religion? Do we have to take Mohammed and Joseph Smith's word for it that they were visited by angels. In fact, the Mormons claim that the way to confirm the truth of the Book of Mormon is to read the book, upon which and that God will confirm its truth by creating a burning in the bosom. It is absolutely foolhardy and, may I say it, takes the definition of “asinine” to previously unheard of limits, to cast our eternal destiny on something that subjective and ambiguous. As my husband says, pepperoni pizza always gave him a "burning in the bosom". In Buddhism, one has to accept some things on a "working hypotheses" and then proceed to test them. Much of Buddhism rests on the fact that Buddha was an "awakened being"... that he actually knew what he was talking about. There is no question that Buddha experienced something, just as thousands of his followers do. However, remembering that feelings and experiences are not necessarily indications of truth, where is the evidence that what he believed and taught is true? Similarly, Hinduism, which has no known founder, starts with blind faith, which is only strengthened by understanding Hindu philosophy. Certainty only comes with spiritual experiences which are explained by various yogis etc. as "experiencing the Divine". The problem being ... how is one supposed to know whether or not this explanation is true, or whether these men were either themselves deluded, or simply wrong. Everything in Islam flows from the first of its five pillars, which states there is no god but Allah, and Muhammad is his prophet. Again, where is the evidence behind the Qu'ran's declaration that there is no god but Allah? And, as we will see later on, Muhammad was a very unlikely prophet. The Bahai faith is no different. Bahá’ullah might have declared himself to be the latest messenger from God, with a stirring message of peace and unity, but where is the evidence that he was indeed God's emissary? In fact, Bahá’ullah's statement about all the world's religions representing different stages in God's revelation to man regarding His will and purpose, does not ring at all true, considering, as discussed before, the various religions of the world cannot even decide how many gods there are, much less what the fate of every individual is. And hell will probably freeze over long before they do. Similarly, while few can argue with the essential message of Sikhism, there is no evidence that Guru Nanak was divinely inspired. We have to simply 'believe' that the New Age channeler is not only in contact with a spirit, but that it is a benevolent spirit, not one intending harm. So What's Different About Christianity? There is no question that "faith" is one of the central elements of Christianity. In fact, the word is found almost 250 times in the New Testament alone. As Hebrews 11:6 states, "And without faith it is impossible to please Him, for he who comes to God must believe that He is and that He is a rewarder of those who seek Him." Sadly, the word "faith" in Christianity is usually misunderstood. Many, if not most, non-Christians assume that Christian faith is "blind faith", defined as a strong, unshakable belief, and unquestioning loyalty, to an absolute belief system without proof or evidence. It is also often thought that Christians ignore reality, or believe contrary to the evidence and facts. In other words, the entire Christian faith is nothing more than religious ‘wishful thinking'. This is as far from the truth as it gets. Hebrews 11:1 says "faith is the assurance of things hoped for, the conviction of things not seen". The word "assurance" means a positive declaration or surety.. intended to give a person confidence and freedom from doubt. We are assured that the things we hope, and wish for, will come to pass. As pastor Greg Koukl says, The Bible knows nothing of a leap-in-the-dark, hope-against-hope faith... ie. a faith with no evidence. . Much to the contrary, the Christian faith is a commitment based on evidence. The Christian definition of faith is simply taking God at His word. And, since there is much evidence in favor of believing that it is He who said these things, this is not, by any standards, 'blind' faith. Rather it is an intelligent response. The Holy Spirit is called "the Spirit of truth who proceeds from the Father" (John 15:26). The Bible is also surprisingly indulgent towards skepticism that is not antagonistic. In fact, it is actually quite remarkable as to how many times, God, Jesus, and the prophets of both the Old and New Testaments, appealed to facts to support what they said and taught. . 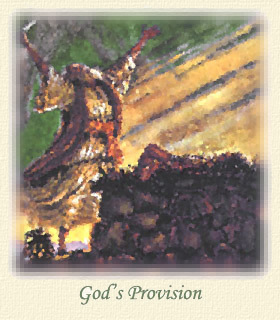 When in Genesis 15, God told Abraham that He would give him the land of Canaan as an inheritance, Abraham asked how he would know this. God neither rebuked him, nor had a fit about Abraham's lack of 'faith'. He, instead, made a covenant with Abraham. In Judges 6: 36-40, Gideon wanted confirmation that God would deliver Israel through him as an angel had told him. The test proposed by Gideon was that a fleece left out all night would be wet with dew, but the surrounding area would be dry. Even after this happened, Gideon, asked to God to re-confirm the results.... this time with the fleece bone dry and the surrounding area wet. In Isaiah 5, God Himself rebuked king Ahaz for not asking for a sign, then proceeded to give him one. In Isaiah 43, Isaiah describes what is very similar to a courtroom scene, in which witnesses testify of things they have seen or heard. In it, God calls on the pagan nations to bring their witnesses, and He would bring His. As he said, the gods they worshiped had no power.... none of them had been able to so much as predict future events. Therefore, the people who trusted in these false gods had eyes, but were blind... they had ears, but were deaf. He then asserted his superiority to all idol-gods, and said His people were His witnesses that everything He had predicted had, indeed, been fulfilled. They were proof that he was the only true God. Through them, He would reveal Himself to the nations, so that they may know, believe, and understand that, in His words... "I am He. Before Me there was no God formed, And there will be none after Me". In Malachi 3, God invites the nation to test His faithfulness and His promises. If they would bring the tithes into the store house, He would pour out for them a blessing until it overflowed. In Deuteronomy, Moses urged the people to keep the word of the covenant based on all they had seen God do for them, including their deliverance from Egypt, and the fact that they had wandered 40 years in the desert... had been fed all that time, and neither their clothes nor shoes had worn out. In Exodus 33, God's anger burned against the Israelites because they had made, and begun to worship, a golden calf. God told them they could make their way to the land He had promised to the descendants of Abraham, Isaac, and Jacob. However, He would not go with them, because they were an obstinate people. He would, instead, send an angel to guide their way. Moses then argued with God on the basis that if He (God) did not go with them, there would be no evidence that he (Moses) was favored of God, and nothing to distinguish the nation from every other one on the face of the earth. When Korah and his company rebelled against Moses' leadership, he appealed to the evidence of God's immediate and physical judgment upon them. In Joshua 3, Joshua gave the people a physical visible sign by which they would know that the living God was among them... He would dispossess from before them all the nations in the promised land. But before that, when the priests entered the Jordan carrying the ark, the river, which usually overflowed its banks, stopped flowing, so the entire nation could cross over. In the New Testament, no one was asked to just believe. They were enjoined to believe based on what they had seen. In his introduction, Luke made it very clear that, after investigating everything carefully, he was completely convinced of the truth of the whole matter, and was compiling an account in chronological order, so that there should be a full, authentic, and accurate account of all that had taken place. The verb Luke used means to trace accurately. He followed up everything to the source. The opening chapters of the Gospel of John begin with the declaration that he was proclaiming what they had seen and touched. Jesus continually referred people back to the Old Testament as a basis for judging His claims, simply because He fulfilled all the prophecies about the Messiah, made hundreds of years earlier. Similarly, in Acts 17:11, Paul called the Bereans noble minded. Why? Not because they blindly believed everything they were being told, but continuously checked the Scriptures to see whether what they were being told was true. Paul, one of the most important figures of the apostolic age and author of two thirds of the New Testament, was initially strongly antagonistic to the Christian faith, going as far as to put Christians to death. While there is no question that it was a vision that triggered his conversion, he subsequently proved that he was a critical thinker, and that he debated and taught based on proof and logic. He often appealed to eye-witnesses in support of his claims (Acts 13.31; I Corinthians 15: 2-9). When accused of stirring up dissension his appeal to the governor was based on facts and logic (Acts 24: 10-21). When brought before king Agrippa, he not only appealed to his experience on the road to Damascus, but to the fact that Christ's remarkable life, and death and the events surrounding them were well known in the region. The central claim of Christianity is that 2000 years ago God took the form of a man, came down to earth, died on a cross, but rose from the dead three days later. In fact, the entire Christian hope depends solely on His resurrection. So much so that, in a first-century letter to the Corinthian church, the apostle Paul wrote the following very strong words... "and if Christ has not been raised, then our preaching is vain, your faith also is vain". (1 Corinthians 15:14 NASB). In other words, if Jesus didn't rise from the dead, then we could just as well take everything He said, write it down on little bits of paper and stuff them into fortune cookies. Which is why the overwhelming appeal in the New Testament was not just to believe, but to believe based on the fact that Christ had risen from the dead, testified to by the many witnesses that had seen the risen Christ. In Acts 22:15, God told Paul that he would be "a witness for Him to all men of what you have seen and heard." In Acts 4:19-20, Peter and John told the Jewish council, that they could not stop speaking about what they had seen and heard. In his letter to the Corinthians Paul did not appeal to circumstantial evidence to prove the resurrection of Christ, but to the testimony of more than 500 eyewitnesses, most of whom must have still been alive at the time of writing . Paul mentions some of those whom the risen Lord appeared to... Peter, the other disciples, his brother James, the apostles, five hundred others and to Paul himself. (1 Corinthians 15:4-8 NASB). Not mentioned however, are the women that Jesus first appeared to. But, if you do undertake such an investigation, do please remember that when the most difficult and obstinate disputes in other fields are resolved by very definite standards, it would be both unfair and illogical to dismiss similar reasoning and standards just because the subject being investigated happens to be Christianity. A very important example is that witnesses are assumed to be telling the truth unless the facts tell a different story, or they are proved to be lying or shading the truth. It is beyond the scope of this article, to go into every detail of the great number of facts that support the Bible's claim to be the word of God. However, I shall cover as many points as possible, providing, in many cases, the URL of more comprehensive articles. One of the most common, yet least understood, reasons behind some of our 'spiritual' feelings can very well be attributed to brain wave frequencies, or the brain's spontaneous electrical activity generated by millions of neurons as they communicate with each other. These frequencies or electrical activity, which will change depending on what the person is doing, are measured in cycles per second (Hz) by an electroencephalography (EEG). The brain waves of someone who is sleeping is very different from the brain waves of someone who is wide awake. The usual frequencies range from Beta waves, emanated by individuals who are alert and actively engaged in some form of mental activity, through Delta which is the slowest of the frequencies, experienced by those in deep, dreamless sleep. The Alpha or "resting state" of the brain, occurs when one's brain wave activity slows down from its usual 14 to 27+ cycles per second to 8 to 13 cycles per second. It is a passive state in which the person is awake, but relaxed. They feel peaceful, have a sense of stillness, and are non-critical and non-analytical, which is why it is not at all surprising that this reduced brain wave activity is said to alleviate stress, relieve tension, and increase creativity. Although Alpha brain waves usually occur prior to and just after, falling sleep, this passive state can be induced by any number of activities both intended and unintended. Exactly the same brain wave activity is found in people who are sitting near running water or simply daydreaming. The Alpha state can also be brought about by many kinds of repetitive activity or sounds, like listening to waves crashing onto the beach. The freeway driver who suddenly cannot remember what he, or she, has been doing for the last few miles is a perfect example of someone lulled into an altered state of consciousness. It is believed that listening to a certain kind of music like Baroque Music, especially the adagio movements with a 40 to 60 beats per minute cycle, can put the brain into alpha. Meditation, yoga, chanting, biofeedback, electrical stimulation of the brain, sensory deprivation, and even the pure, but wavering, sound of Crystal singing bowls are all intended to produce Alpha, or even Theta brain waves. For hundreds of years, Native Americans have used certain patterns of drumming to induce a trance like state. Rhythmic dancing can do so as well, as attested to by the Sufi dancers who whirl themselves into ecstatic trances. In other words, an altered state of consciousness can induce not only a feeling of calmness and peace, but sensory and psychic sensations including a mystical oneness with one's surroundings. In other words, these sensations and feelings could have absolutely nothing to do with attaining oneness with Deity, drawing nearer to God etc. but may, in fact, be exalted terms used to describe normal brain activity. (1) Skirda, R. J., and Persinger, M. A. "Positive Associations Between Dichotic Listening Errors, Complex Partial Epileptic-like Signs and Paranormal Beliefs," Journal of Nervous and Mental Disease, 181, 663 (1993). Temporal lobe lability refers to a person's sensitivity to altered states of consciousness. I don't mean the dramatic ones, such as religious visions. I mean the more subtle ones, with phenomena like deja vu, 'sensing a presence', pins and needles sensations, fleeting visions during twilight sleep, and other common episodes. How Can Jesus Be the Only Way? By Dr. Philip G. Ryken. pastor of Tenth Presbyterian Church (Philadelphia, Pennsylvania. http://www.modernreformation.org/default.php?page=articledisplay&var2=605 ). Unfortunately this article now only seems to be available in the magazine Modern Reformation, for which you either have to fork over $32.00 For a one years subscription delivered to your mailbox, or $25.00 for the digital version. Satguru Bodhinatha Veylanswami. The Three Stages of Faith. October/November/December, 2009. Austin Cline. Religion as Faith and Ultimate Concern. What is Religion. Joel Stephen Williams. The Real Jesus of History.